I am expecting engineers from Imagine to install Wimax in my house later this week. This will be the third time I will have change ISP. I started out with BT, but they were hopeless. Every time I tried to get them to resolve a problem with my connection they blamed my eircom phone connection for everything. 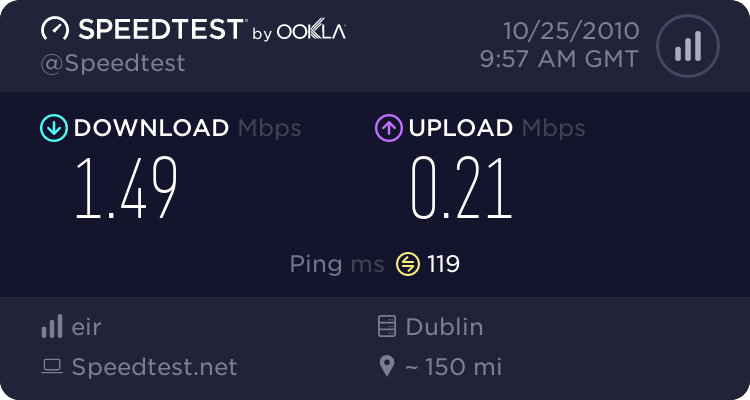 I then tried to get eircom to take over as my ISP, but they were taking so long to send me the gear that I switched to ClearWire instead. I lasted two years with ClearWire despite constantly only getting about 50% of my so-called 2MB connection. I then switched to eircom. I posted recently about their email to me congratulating me on my "new 8MB connection". Instead of making me feel happy, they have got the complete opposite reaction - I'm leaving them instead. The reason I am leaving eircom. Here's the reason: A speed test on my line this morning shows a download speed of 1.49MB. That's less than 20% of what I'm supposed to be getting. I know I'll never get the full 8MB, but this connection is shite. eircom Tech Support is shite. There are five people in my house using the web - we need better service than this. We are paying for a better service - so be warned, if you do not provide me with the service I am paying for I will move. I'm moving to Imagine's Wimax 7MB service - but is this the best thing to do? Already I'm worried. I am 1.38km away from the Deansgrange transmitter (I measured it in Google Earth), but the Wimax box cannot pick up a strong enough signal for a 7MB connection. There are no tall buildings between my house and the transmitter - in fact most of the direct line between us is through Deansgrange Cemetery. Imagine are sending out an engineer to set up a booster - I do hope this works. Others are also concerned - @keithmalone tweets to me "@eoloughlin are you keeping the Eircom as a backup in case wimax ever goes down?". Roma is dropping Imagine in favour of O2 in the Pharmacy - she has been very unhappy with Imagine. Imagine don't have Tech Support at the weekend. I wonder what ISP I will be changing to in a few years/months time? UPC has been very good or me, got up to 20MB speed and it was reliable. Using Eircom NGB running at 8MB and it works great.